Remember when you were a kid in the summer and you’d sleep ‘til 11:00 and then feel it was your Constitutional right to spend the afternoon at the beach? I thought when you got older, life would be like that. You’d have a lot of time on your hands and you could laze around. Not so. My babyboomer friends and I seem busier than ever. Somewhere along the line of working and raising a family, I developed the mantra that for it to be a good day, I had to accomplish something. This has left little time for lazing around. And of course, there’s always many things to do. I rarely sit down for longer than a few minutes unless it’s night time. Today, I have. It was a beautiful morning and I decided to drink my coffee, sitting on my deck. It was a revelation. Our dog Bogey kept eying me with suspicion, sure that I would leap up in a minute, but finally he trusted that I was sitting still and he jumped up to sit next to me. Then I heard this beautiful birdsong that I’d noticed for several days. I looked around to see where it was coming from, and saw a bird, its chest dusted in red, sitting on the rail. It trilled again and then flew away. I sat quietly and finished my coffee, wondering what kind of bird this was. Still sitting, I pulled out my iPad and emailed my brother, the bird whisperer, about the bird. He emailed back a couple of suggestions. 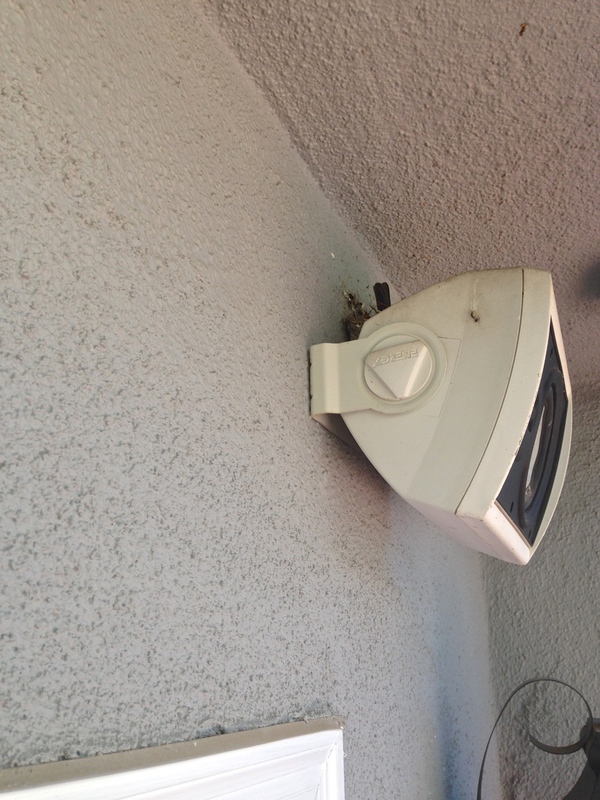 Then I remembered that over the years, we’d had birds nest in our outdoor speakers. I looked up and sure enough, I could see a nest. I went inside for food and when I came back, I heard cheerful chirping. The birds were there. Were there babies? I wondered. Were there eggs? I decided I wanted to see. I got a foot stool, but it wasn’t high enough. I couldn’t find the stepladder so I brought out the kitchen stool. Now, I’m recovering from knee surgery and subsequent back problems. When I looked at how high the stool was, even I wasn’t that stupid to use it. All this time, I heard my husband’s voice in my head, yelling at me: What in the hell are you thinking? Really, you’re going to climb up on something unsteady to look in a nest? Are you crazy? 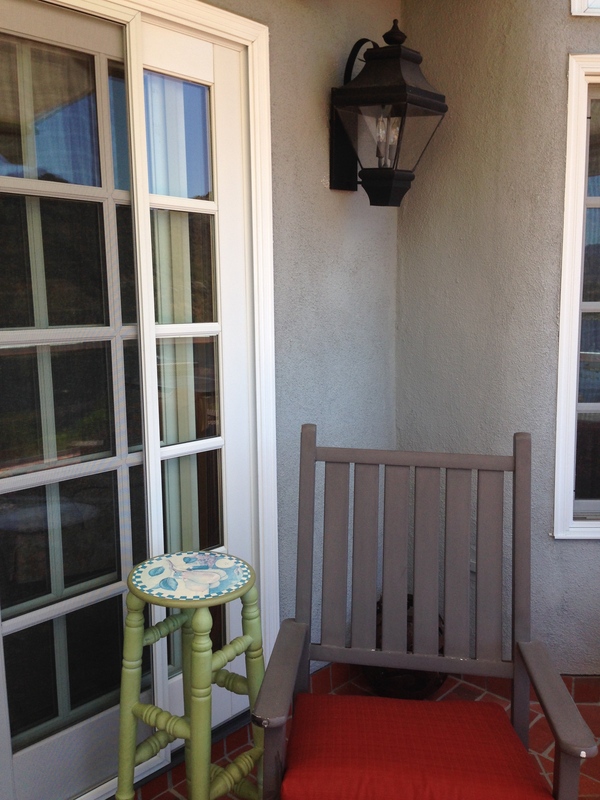 Thankfully, in real time, he’s golfing, but I was very careful when I picked up the small table by the outdoor chair and moved it into position. Climbing up on it was a challenge with my knee, but I managed it. I still could have used something higher, but I decided that could wait ‘til tomorrow. 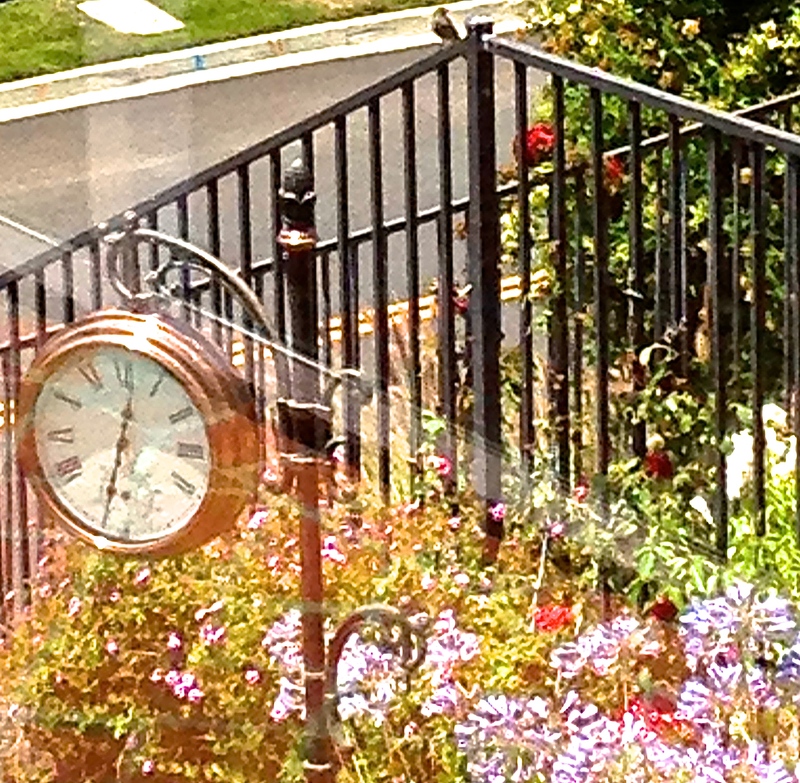 Meanwhile, all my maneuvering disturbed the bird, which flew away to the backyard. This, at least, gave me a photo op. I went back into the house, noticing all the tasks I need to start or finish. But, the writing bug bit me and here I am, talking with you. I’ll find out more about the birds tomorrow and let you know. Meanwhile, if you can tell by the photo what kind of bird it is, let me know. I’m going to take a nap.